“WIP It Real Good” challenge: Members are committing to finish a work in progress (WIP) each quarter—and we mean really finish, all the way through binding! Word has it there may be prizes involved. Either way, it’s proven that public commitment is a strong motivator. Improv triangle exchange: Six 60 degree improv pieced triangles times five months equals one very exciting quilt! Our exchanges will run from February through June, with finished work revealed at the October meeting. Guest speaker Justin Stafford of Keaton Quilts: Trunk show at the April meeting, followed by a workshop. Kathy finished the quilting on this quilt for her son’s girlfriend. 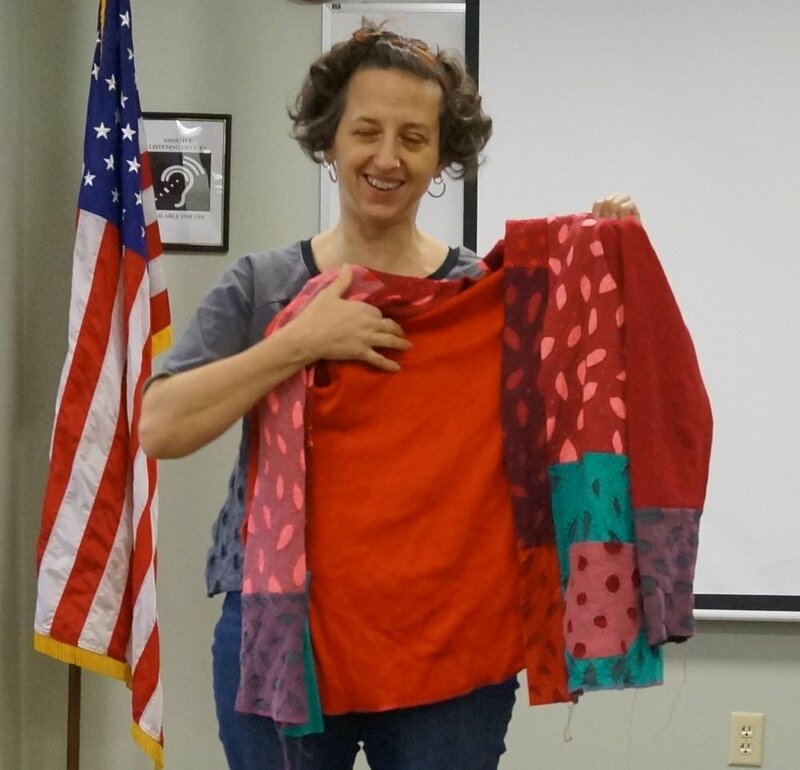 Denise put together a top from the blocks she made in Sue Ahnrud’s “Swirls of Scraps” workshop. Celine made a quilt for a friend’s baby, using fabric from the crib dust ruffle. Celine also finished her split nine patch quilt. Sarah made a flying geese mini. These improv trees are perfect for Tina’s purple bathroom. Nicole made this quilt for a friend who is a brew master. Melissa is working on a cardigan made from old T-shirts with Alabama Chanin-style applique. The pattern is the Blackwood Cardigan by Helen’s Closet. Close up of Melissa’s applique and the book that inspired her. 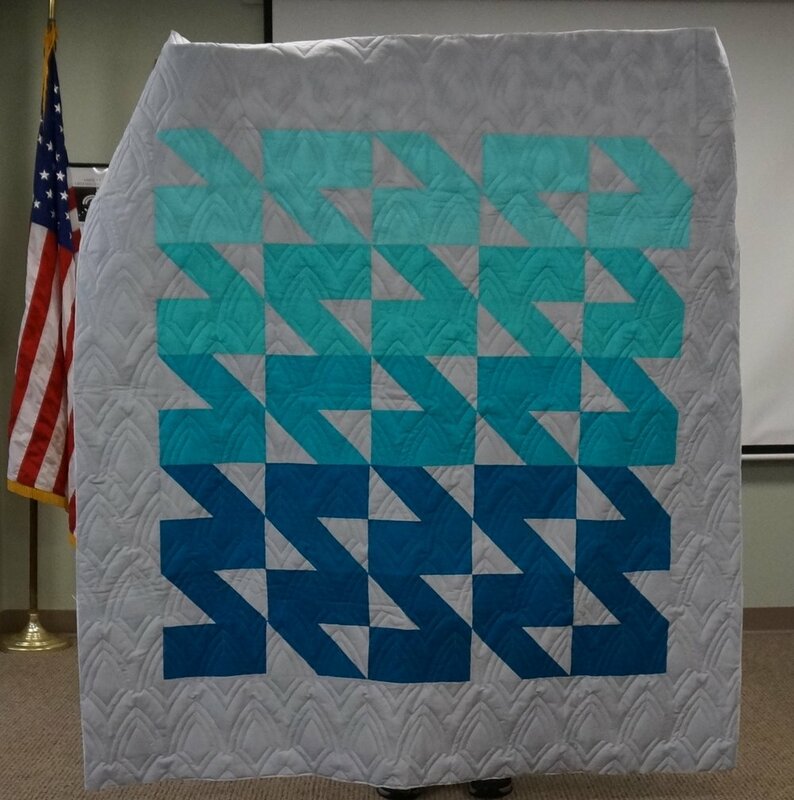 Sue used a panel to show off her stunning quilting. Suzanne will have two quilts in shows this year. The quilt above, “Edith and Eleanor,” will appear in an exhibit at the New England Quilt Museum in April. Suzanne also has a quilt in the “Stepping Inside the Outside” exhibit at the Bristol Art Museum from February 1 through March 10. Ann made a quilt with UFO blocks she bought from the guild’s dollar table a few month’s ago. Karen (almost!) finished this quilt for a friend’s daughter. SEE YOU AT THE FEBRUARY MEETING! Saturday, February 2, 10:30 a.m. - 12:30 p.m. in the Hayden Center, Room 2. Stay for open sew 1-4 p.m.